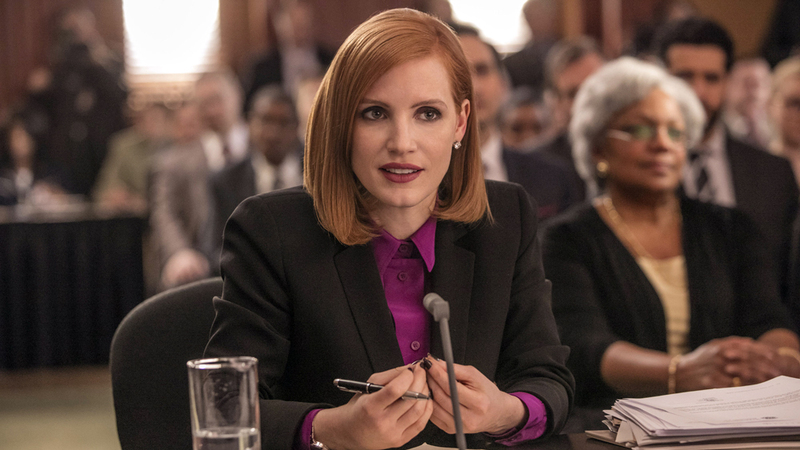 A spirited political thriller, Miss Sloane boasts a phenomenal Jessica Chastain performance and a rewarding plot. In Washington DC, high-powered lobbyist Elizabeth Sloane (Chastain) is dragged in front of a congressional hearing presided over by Senator Sperling (John Lithgow) investigating allegations of unlawful influence peddling. In flashback, the events of the prior three months are revealed. Sloane is the star lobbyist at the firm of Cole Kravitz & Waterman managed by George Dupont (Sam Waterston), currently working for Indonesian interests to oppose a proposed palm oil tax bill. She refuses an assignment by the gun lobby, represented by Bill Sanford (Chuck Shamata), to oppose a pending gun control bill. 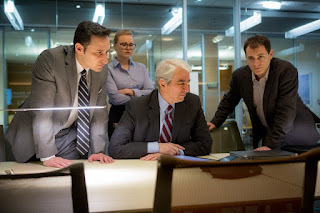 Instead, she defects to the smaller firm of Peterson Wyatt, run by Rodolfo Schmidt (Mark Strong), to lobby for the legislation and takes half her team with her, although loyal researcher Jane Molloy (Alison Pill) refuses to join the exodus. Despite being massively outspent, Sloane's team make progress in securing congressional votes. Team member Esme Manucharian (Gugu Mbatha-Raw), herself a victim of gun violence, emerges as an eloquent spokesperson. In desperation, Dupont and Sanford launch a smear campaign targeting Sloane's reputation. Directed by John Madden, Miss Sloane is an electrifying talkfest. Thanks to a gripping Jonathan Perera script, this is a remarkably taut story centred on a captivating character who redefines what it means to be highly-strung. The 132 minutes of drama whiz by effortlessly, Madden building up an irresistible head of steam with a classic David versus Goliath battle for control of the soul of Congress over one of the most heated issues in American politics. Elizabeth Sloane is one of the most compelling women to command a movie. Addicted to psychotic drugs that keep her awake, she works 16 hours a day, thinks and talks twice as fast as everyone else, and runs laps around her opponents. She also does not hesitate to use and hurt people close to her, abuses the trust of others, and leads a lonely life that includes hiring male prostitutes to emotionlessly satisfy her sexual desires. Ironically, her latest gigolo Forde (Jake Lacy) gets closest to cajoling personal thoughts out of her overactive mind. Chastain gives the performance of her life, and is never better than when fine cracks finally start to appear in Sloane's seemingly impenetrable armour. And Perera surrounds Sloane with plenty of worthwhile allies and enemies. Esme Manucharian blossoms from behind-the-desk researcher to media star under Sloane's tutelage, but the master lobbyist still has other plans for her young protégé. Rodolfo Schmidt thinks he knows what he is doing when he hires Sloane, but is soon barely hanging on as she rumbles through his firm like a tornado. And Jane Molloy, who stays at the slick firm of Cole Kravitz & Waterman to battle against the gun control bill, finally has a chance to emerge from Sloane's shadow and create her own legacy. Multiple story lines are nurtured, developed and brought together in the film's final third. The proposed tax on Indonesia palm oil, the gun control bill, the campaign to sully Sloane's reputation, the bitter battle between firms, and Sloane's own crystallizing view of her personal morality come together in a stunning climax. Miss Sloane plays a high stakes game in the unforgiving political arena, where both the strategic maneuvering and the price to be paid are spectacular.